Rocco Mediate lifts the Senior PGA Championship trophy. (Benton Harbor, Mich.) What was the biggest story coming out of the Senior PGA Championship at Harbor Shores? 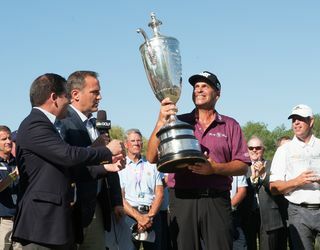 Well, besides the popular victory by Rocco Mediate in record breaking wire-to-wire fashion, I’d vote for the announcement that the tournament will be returning to SW Michigan at least four more times in 2017, 2019, 2021 and 2023. For area residents if not the state, that’s good news and reflective of Whirlpool’s corporate commitment to not only the tournament but to the long term health of the Harbor Shores development. In short, Whirlpool and KitchenAid as the presenting sponsor remain all in. For sports business mavens, the added announcement that KitchenAid will now be the title sponsor of the oldest senior championship in golf raised some admiring eyebrows. And it lasts until 2024! As someone observed, “securing a long term title sponsor in this highly competitive space is quite the accomplishment.” So a tip of the hat to the PGA of America, to Whirlpool, Harbor Shores and the Benton Harbor community for forging such a successful alliance. But you don’t win championships by ball-striking alone. You have to get the ball into the hole. On that note, Mediate gave a nod to John Daly for a putting tip prior to the tournament. Daly noticed Mediate was moving his knees during his putting stroke. Mediate quieted his lower body and started making more putts. I remember a similar story back at the 2001 Buick Open Media Day when Mediate was brought in as the defending champion. At the time, Tiger Woods was in his heyday as the game’s dominant player and Mediate was asked to comment. I recall Mediate marveling at Woods putting wizardry. At the time, Mediate said when “Tiger putts it’s as if his lower body is embedded in cement. There’s no movement at all.” Now 15 years hence, Mediate ironically was reminded of that same tip. Practice range: The Michigan Section of the PGA admirably staffed and ran the practice range at Harbor Shores. Pros from around the area and state volunteered their services to oversee the range and making sure all the details were properly handled. I spent some time there on Thursday and chatted with the Section’s Kevin Helm and Justin Phillips. Along the way, I was reminded how relaxed many of the “Senior pros” are in contrast to the all-business PGA Tour competitors. For example, Jesper Parnevik warmed up by hitting shots with a weighted club directly in front of the grandstand where a pair of elderly spectators were sitting. After hearing their comments about the club, Parnevik interrupted his routine and kindly brought the club over to them, allowing them to hold it and feel its weight. Can you imagine one of the regular PGA Tour stars doing something like that? And this was on Thursday, the first day of the championship.